What, So We’re a RUGBY Family Now? UPDATE: A revised and condensed version of this sportsy meditation on sonship and daddery appeared at the on-line long-form sportswriting site The Classical on November 26, 2014. I still like the sprawling ME-ness of this piece, but the tighter form @Classical has lots to recommend it, too, even apart from costing you less time! The thunder began at 5:45 a.m. The shower is next to our bedroom, and Rugby Boy was in it. (Spoiler alert: this time, he did not flood the bathroom.) I tried to imagine myself back into dreamland, but I fear the thunder. 6:13: Size 11 hooves rattle the beams as a herd of buffalo thunder manfully to the kitchen. (Wow, I think. Half an hour from bed to breakfast. He’s getting faster!) It didn’t look like dreamland was an option, but after a few more rumbles of downstairs thunder, I heard the sonic boom of the front door banging shut. 6:45! Wow the second. He’s going to be early for practice! What had gotten into my son? 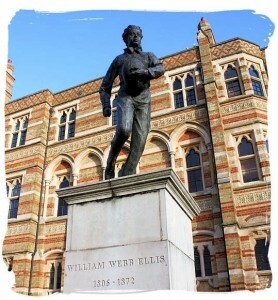 Where it started: Rugby School, England. 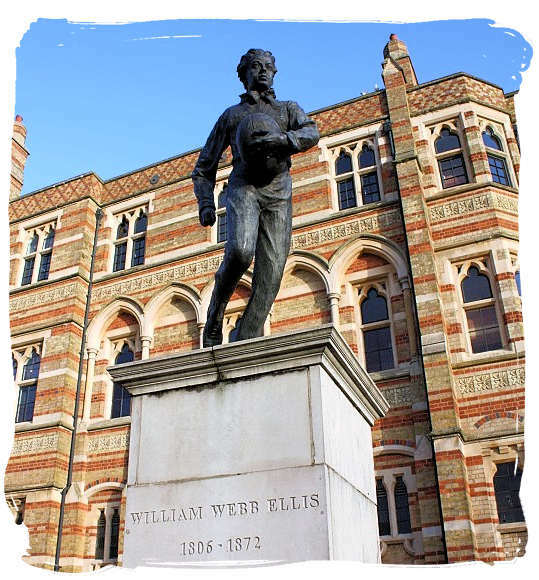 Young Ellis picked up the ball and the rest is rugby. I’d thought that I might get out of bed and bike over to see Thunderhoof and His Flailing Limbs on the high school rugby pitch for his 7:30 workout. Meanwhile, I continued doing what a tired old coot-of-sporting-colours does when sleep is hopeless: I thought about basketball. Rugby isn’t my game, and never was. Back in Canada, I’m a wanna-be hoops guru again. I’m reading and noting, observing practices and networking, and obsessing over possibilities and plans, to say nothing of all the technical adjustments and teaching points my stormy brain whips up for imaginary teams. (Fire in the belly: sometimes it feels more like heartburn.) I want to blame Thunder Bunny the Rugby Boy for my broken sleep, but his crashing about only punctuates my sentence of wakefulness. Besides, going to rugger practice with him might be <yawn> fun.